Do you know why Lombok is such a popular island for tourists from all over the world? That’s because almost every single village there is unique and has a strong historical background that we all want to know more about. 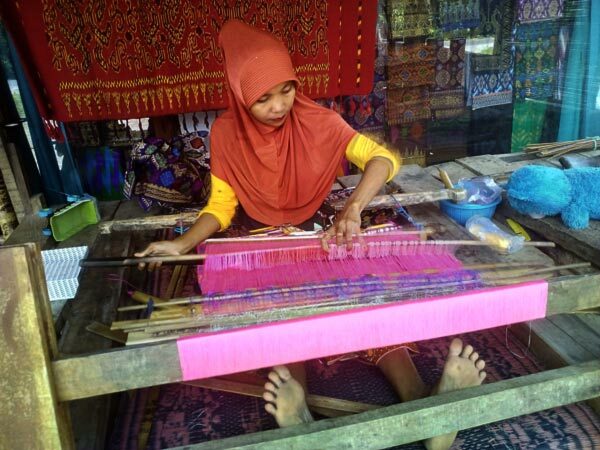 Weaving is one of the most ancient and traditional arts in Lombok. The locals have been doing it for many centuries and that is exactly why their clothes are of the highest quality. You’ll be able to find that out for yourself when you visit Sukarara weaving village. You won’t find any machines there, and that’s not because the people can’t afford it: they have their own techniques and methods and use traditional tools to get the job done. Around the world, Sukarara is well-known and respected as one of the finest centers of weaving. And, as you might already imagine, the lives of the locals are built around this craft. They spend their days and even nights working with the tools they have to provide for their families. Just like the pottery villages, this one is fully focused on creating high-quality products for sale. They produce all kinds of sophisticated merchandise, including clothes, dresses, blankets, scarfs, and even table covers, all with high-quality and unique motifs. As soon as you step foot into Sukarara village, you’ll fall in love with it instantly. You might think that there are tons of villages similar to this one on planet Earth, but that’s not really true. These people have been relying on their own selves for many years and make competitive merch with ancient tools and techniques. That’s something very few folks can do these days. By the way, you will find a lot of women working as weavers in Sukarara. Here comes a fun fact: back in the day, the locals used to believe the myth that claimed any man who weaves will get infertile. Obviously, that’s a bunch of BS, but we’re all superstitious to a certain degree, aren’t we? Thankfully, nobody is afraid of this myth anymore. The modern-day men at the village are just as great at weaving as their women. At the same time, the fellas usually specialize in tenun ikat (string weaving) while the ladies focus on tenun songket (that’s when the weave is embroidered with gold /silver threads). Women have smaller hands and are more flexible, which is perfect for this kind of job. As for the materials for weaving such as cotton fabric, silk, silver/mersis threads, and nylon, they are mostly being imported from outside the island. At the same time, for coloring, the villagers still use traditional materials including the seeds of tamarind, turmeric, and betel vine leaves, to name a few. So, did I get you excited enough to want to buy some weaved cloths in Sukarara weaving village? Well, I’m happy to say that the available options are truly enormous and you will, without a doubt, find something that’s close to your heart. I’ll have to mention that the most popular motif (texture, pattern – you name it) around here is also the unofficial symbol of the village. It’s known as subhanallah, and the name comes from the Arabic language if you can believe that. According to the local legends, when the weavers started working on this exact motif, they would repeatedly say ‘subhanaallah’. What’s the reason behind that? This motif is pretty hard to weave, and it takes quite a long time to make it; hence the name. Beside the famous subhanallah motif, there are many others available for the potential clients: those include Keker, Serat Penginang, Cunglik and more. Alright, what about the price-tags? Naturally, they vary, depending on the difficulty of the product and the time it takes to make it. For example, a simple scarf will cost you around 25K IDR, which equals about 2 American dollars. As for a dress/shirt, 3 million IDR is what you’ll probably have to pay (that’s about 220 dollars). If you prefer batik cloth, Sukarara Weaving Village got you covered as well. Both handmade and printed, this material is available with the trademark Lombok quality. The prices range from 600K to 1 mil (43 to 72 dollars). As a village with one of the finest clothes on the planet, Sukarara is a very popular spot for the tourists. So, don’t be surprised when you see folks from the Western Civilization communicating with the locals. The village is approximately 25 kilometers away from the city of Mataram (it’s the capital of the West Nusa Tenggara province and has a population of over 400K people). Sukarara, the village, is one of the biggest drivers of the economy in Lombok – has been for a very long time. Today, its production is very popular overseas, mainly thanks to songket, the “magical” local fabric. The second you step into Sukarara, you’ll be welcomed by beautiful women dressed in traditional Sasak clothes. And they’re always happy to demonstrate their skills in weaving. If you’re interested in the techniques behind weaving songket, then by any means, ask them to show you a couple of tricks. And while it takes years of dedicated work to master the art of weaving, especially when it comes to the more sophisticated clothes, the visitors are free to participate and try to weave something as a part of their journey to Sukarara weaving village. Believe me, the experience will be quite amazing! Pretty much every single person in the village knows how to weave – they do it at home. Almost every single household has its own loom. As mentioned above, back in the day, only women were supposed to weave, while men were busy as farmers taking care of the fields. And, there’s an old tradition that claims ladies who want to marry a man have to know their way around songket and make something for the future family. So, what about those women that simply can’t do that? According to the ancient laws, they aren’t allowed to tie the knot with a man. However, there is a “workaround” which involves paying a certain amount of money as a fine. Fines can be both in cash and in rice yields. Sukarara weaving village has also perfected the art of Ikat. Essentially, it’s a dyeing technique that allows production to go much faster. Overall, the village is great if you’re not just another regular tourists doing some basic sightseeing. If learning more and seeing more is the main goal of your trip, then you’ll be pleased by the various techniques and customs that Sukarara is famous for. So, without further ado, hop on a plane and fly all the way up to Indonesia. Lombok will take your breath away, that’s for damn sure! It goes without saying that motorcycles are the best choice when you’re traveling on an island. First of all, you’ll get to admire the view and feel the wind in your face. Second, the narrow alleys won’t be a problem for you. To get to the majestic Sukarara village, you’re free to choose between a personal/rental vehicle and public transportation. And while a bus with tons of people might not fit your idea of having fun and embarking on a journey, it will take care of the route and you won’t have to worry about getting lost in the middle of nowhere J. So, if you’re planning on using a rental car/bike, follow my instructions carefully. Make sure to take the Mataram-Cakaranegara-Kediri-Sukarara route. Mataram is a pretty big city with a well-developed infrastructure, and it won’t be a problem to rent a vehicle. On the other hand, if public transportation is your choice, you’ll have to take two routes: Mataram-Bertais (3K IDR) and Bertais-Praya (6K IDR); and, stop at the Renteg station. From there, I’d highly recommend paying +/- 5K IDR for an unforgettable cidomo ride. It’s basically a carriage driven by horses, and it will become one of the finest experiences on your way to Sukarara Weaving Village. Oh, and it’s 5K IDR for one person! Please keep in mind that public transportation in this region is not that developed and you might have a hard time catching a ride on a bus. Thanks for the insights. You never know what you'll find in a foreign country. The prices are, indeed, very low. The production quality is top-notch. The women are beautiful, the men are very friendly and helpful! Weaving is a true art form, that's for sure. I didn't really care much about it before my friends took me to Sukarara. Now I love it! I'm so happy I went to Lombok with my friends! And your article played a role in that. Everything was super-smooth and I even did my best to weave - it was an amazing experience. Too bad the locals don't speak any English, though. The bus ride is no fun at all. Cash in for a brand-new rental bike and be one with nature. We loved riding through the sunset and arriving at the village with lifted spirits. Be careful on the road, though :).